We at our Melbourne-bird-vet see Leg bands that often get to tight, and constrict the blood supply. 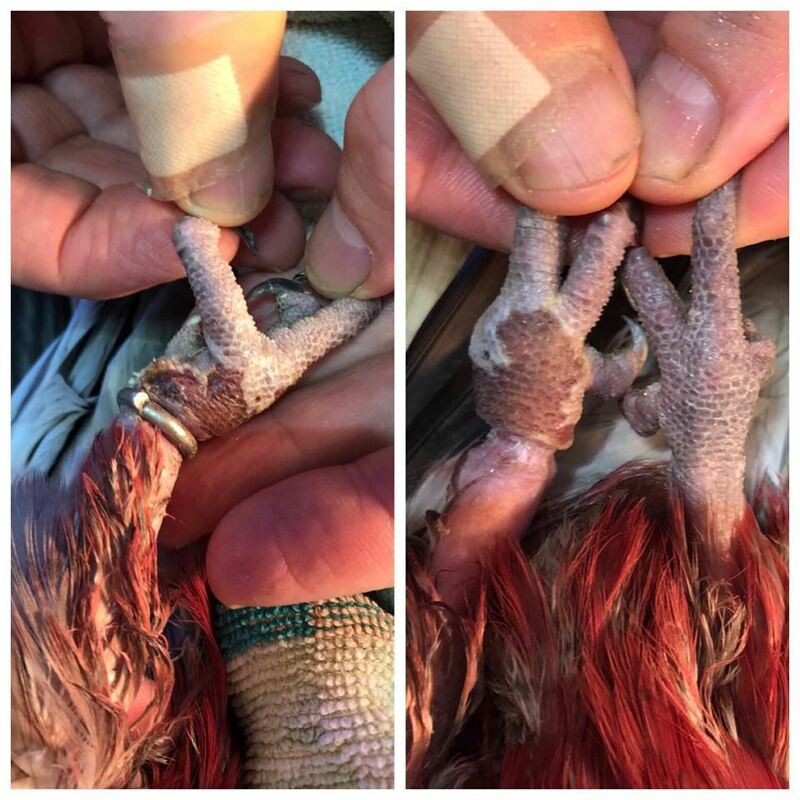 The birds foot becomes Painful and swollen as the leg band further constricts the venous blood flow. The birds foot below the leg band becomes so swollen and eventually the miserable painful patient looses its leg. the condition of a tight leg band in a parrot is easy to treat if caught early enough. As the birds bones are thin and brittle - we remove tight leg bands under general anesthesia. many bands are stainless steel and so very difficult to cut. Using a super fine diamond bur and a dremmel the band is cut in two places and literally falls off. the procedure is done during the vet visit and takes about 10 minutes. The patient recovery is rapid and the pain and swelling immediately relived. Bird veterinarian Dr Phil removing a tight leg band from a Quaker parrot. Does your bird have a leg band? It may be an accident waiting to happen ! Last week (Aug 2018) we had to remove a leg band from a Galah that had become tight and embedded in the leg. We, as a referral avian vet clinic, often routinely remove leg bands before they cause problems ! To remove a leg band, the bird is placed under a general anesthetic and then we cut through the band. Leg bands are good for identification, of aviary and breeding birds, but can cause injury. For pet birds we recommended that they be removed once no longer needed. Bird Micro chipping is a much better way of identification and there are many disadvantages to leg bands including: they can become too tight, which cuts off circulation and can cause injuries, deformities or necrosis which results in veterinarians having to amputate feet and limbs, they can harbor mites, they can become mis-shapen - causing them to cut into legs which can cause pain infection, they can catch on toys and other objects, they can become caught in cage bars - causing the bird to possibly injure the limb or gnaw off the foot to free their leg, and seeds, dirt, and other debris can become caught in-between the band and the leg. If you would like more information or would like to book in to remove your bird's leg band, please book a visit. Just a fter the leg band removal in a Galah , A Cockatiel with the loss of a foot from a tight leg band ! !